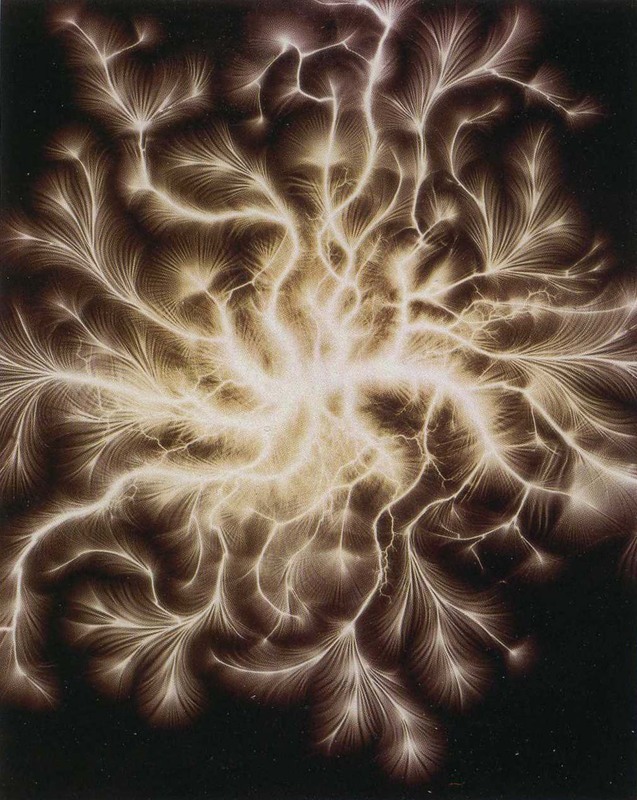 A beautiful and inventive way of addressing issues of perspective and un-reality in the centuries before the introduction of electricity was more able to suspend belief in the existing/obvious was via the catopticum1. 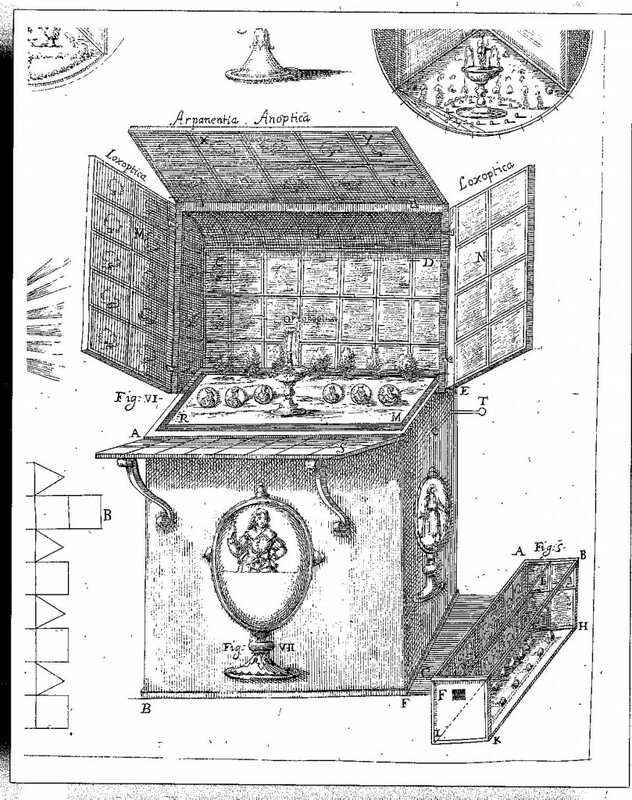 This object (an example of which is pictured below, taken from the oddball/genius/problematic polymath Athanasius Kircher in his book Ars Magna Lucis et Umbrae...2 printed in 1676), and the name of which is taken from the Greek katoptron, mirror) was an advanced parlor toy and artwork, a sort-of primitive free-standing theatre of multiplied objects, a box that contained things that were seemingly larger than their container. 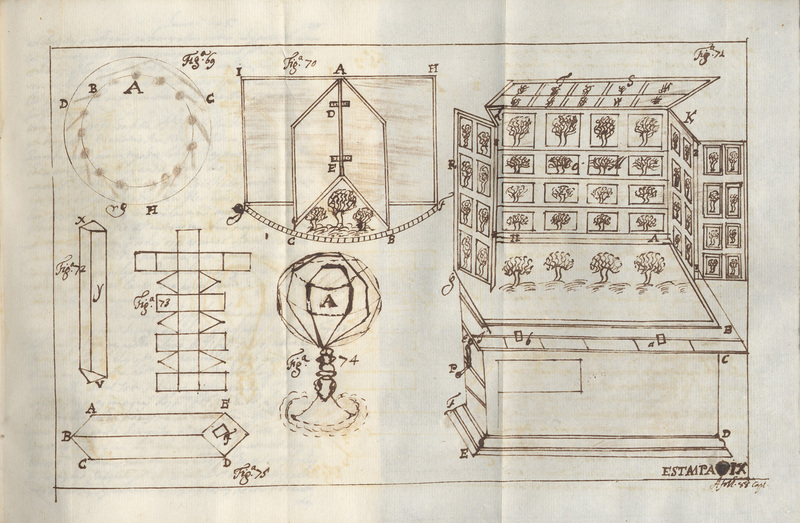 Source: Kircher at Stanford University, here. Source: Tratado da Catoptrica, (manuscript, 1716); from the Biblioteca Nacional Digital, here. It's a romance of images machine, a box of antique wonder, a peepshow of centuries before, putting more things into a space than could exist. It was a relatively simple machine of great ingenuity: the interior of the free-standing box with rows of holes along its top edge perpendicular to the ground, and was lined with mirrors (as shown above in the Spanish document), with some mirrors set of at 45% angles; when objects were placed within the imaging-area of the angled mirrors, the object was multiplied, and then multiplied over and over as a result of the surrounding mirrors, creating in effect a "hall of mirrors", leaving the observer with a sense impression of many dozens of objects that were contained within a container that was impossibly too small for what was being seen. This of course is a property of some holes--they tend to make things larger than they could previously possibly "be". In this case, the viewer would look through a hole into a Borgesian box which would contain a multitude of its possible interiors. Looking through a hole in the end of a glass and mirror-ended tube and pointing it at the sky at night would reveal an enormous multiplication of a small part of that sky. In the early case of Galileo, what was first seen with the telescope was the multiplication of what was believed to be a finite and god-granted sky of perfection--he was seeing into some other sky, into a new vault of heaven, something never before seen, above-and-beyond what was known to exist. Hooke and Louwenhoeck had a similar experience with their (second generation) microscopes, seeing details and life never before encountered, entire worlds in a place no bigger than the head of a pin. Sometimes a hole is just a dark thing; but more often than not, it isn't. 1. From the Greek, katoptron, mirror or pertaining to a reflected image or reflected light, such as from a mirror. There is another sort of catoptric that has been sort of widely used in antiquarian painting and parlor entertainments, which involves a canonical mirror reflecting a wide-field and distorted image into its proper perspective, which is known as catoptric anamorphosis. Another version of this sort of optic imaging is optical anamorphosis, which requires the viewer to stand at a particular (usually sharp) angle to a painting containing a semi-hidden image whose proper perspective is revealed only at a particular angle of viewing. 2. Ars Magna Lucis Et Umbrae In X. Libros digesta. Quibus Admirandae Lucis & Umbrae in mundo, atque adeo universa natura, vires effectusque uti nova, ita varia novorum reconditiorumque speciminum exhibitione, ad varios mortalium usus, panduntur. Editio altera priori multo auctior. The work is presented at Bibliodyssey, here. It would have been difficult to imagine structures of any greater height here in pre-elevator (and pre-elevator/Westinghouse brakes) and early post-iron-structure days than the spire of Trinity Church. This Trinity (the third and current occupiers of an old spot at 79 Broadway, the first of the Trinitys going up in 1698 with the help of he block and tackle of Capt. William Kidd, privateer/probably-not-pirate) was the tallest building in Manhattan when it was built in 1846 (at 281' to the tip of the spire), and remained so the tallest until the construction of the New York World Building (305') in 1890. (The World building was torn down in 1955 to make room for another on-ramp for the Brooklyn Bridge.) So when this image was published it was still another 15 years away from anything being taller than the Trinity tower, which meant it was a pretty fair leap of faith to assume department stores crowding out the church's airspace back in 1875. There are many more colorful approximations of what might happen in Manhattan, one of which I've included below, showing the full and complete development of downtown, with trains leading away from the city right through the Statue of Liberty. This peep into a possible future appeared in Harper's Weekly on 18 May 1887. It is the work of artist W.A. Rogers and depicts a filling-up lower Manhattan, complete with broad avenues lined by elevated trains whose reach evidently knows no bounds. The new elevated subway winds its way across the harbor to Liberty Island, where it wraps itself around the feet and up the body of the newly--dedicated Statue of Liberty (opened in October of the previous year). In the foreground is the cupola of a transit station with a fluttering flag advertising "Coney Island via Broadway"--I'm not sure what this is all about, as the placement of the island has nothing to do with anything except making a point in the cartoon. It is interesting to see though that the Trinity spire is still very visible. In today's quick dose from Dr. Odd we find the "United Air Line" (so close to the name that actually came into being), ca. 1900, featuring an enormous and extraordinarily heavily-bodied airship of a construction of pure speculation. It is gigantic and weighty, and it seems as though the thing is powered by pulsating awning-like wings and a series of covered propellers, all under what seems to be sail. The crowds bustling beneath the behemoth seem as any other crowd waiting for the subway, or third class, or, well, whatever sort of mass transport would await and was taken for granted. There are no bands, no fireworks, no fanfare, just the arrival/departure of yet another airship leaving for London from New York City, as much a cause for attention as any airliner traveling overhead. Source: New York Public Library Digital Collections, here. Source: New York City Digital Collection, here. This remarkable cutaway (1910) shows what might have been considered a possible future for the future of possible New York Citys . This one features a very highly respectful continuous conveyor belt of humanity coursing through the Great Underneath, replacing the ideas of subway transport. A seat would always be available if it was so, just a=one giant beltwork of seat stretching from SOuth Ferry to Uptown and to Brooklyn and so on. But since it was always moving it would have to move a little slowly for people to hop on and off, so a trip to the then-Uptown might take some time. Source: New York Public Library Digital Collection, here. What a Biologically-Downloaded Intelligencer Virus Might Look Like in 2112. Somehow, in some way that is difficult for us to imagine in 2012, these ads were attractive enough in the mid-last-century. Of course we have our own examples of this behavior, only more-so, I expect, given the vast multiples of advertising we undertake today. Somehow it feels as though there just isn't enough space in our own year for the sheer weight and smell of ads, and that some of them must be occupying and stealing oxygen from our time in the future. Then again, in the future maybe we will all be paying for quiet in our brains so as to not be subjected to nothing but constant streams of commercialism, perhaps inherent in our neurons, ads becoming a part of the very part of the thought process, commercials interrupting our creative process, and popping up at appropriate times in the process of recollection. (Happy thought, that). 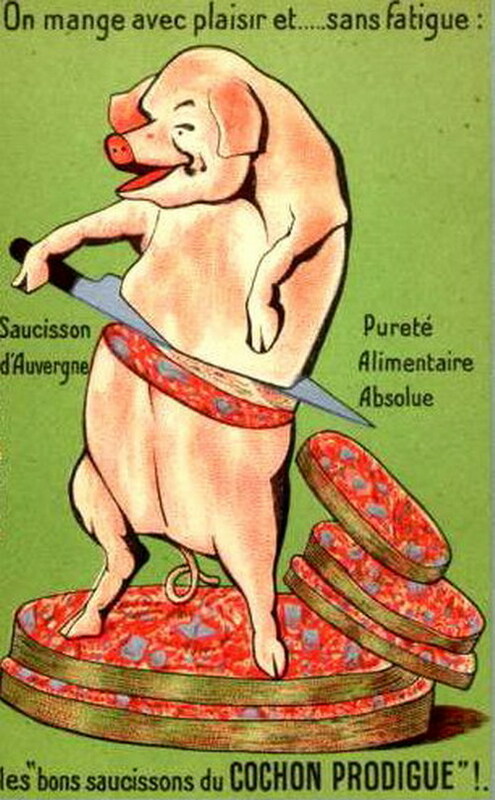 And so this might look to be an unbelievable, incoherent way of attracting someone to eat pork bellies and eyelids--but at least it appeared in a print ad in 1948 (or whatever), and that was the end of it. In the future if this was seen once it might be possible for the thing to be incorporated in a memory process that had anything to do with the letters "p" "o" "r" "k" when put together in a row, frontwards or backwards. That'll be when we have to pay for our memories to be cleaned of commercial sponsors. I can see a short story developing from this, of a person in the year 2112 (on 11 November) having a problem with the artificial memory intelligencer--the things that would make us "smart" in the future--where the biologically-downloaded data contained a virus (literal or figurative) that caused the man to think about this image every time a thought was thunk. And there was nothing that could be done for him, short of him raising twice the labor exchange units that he had access to in order for this image to be expunged. No ransom payment meant seeing this pig a thousand times a day. And so a new crime is born. I've collected some of the unusual posts that I've done on this blog regarding the hard tendencies and shallow measures of meat. The Ineffable Religiosity of American Meat Memory, here. Women Meat Pioneers of 1943, here. Anatomy of Womanly Desire–Aprons, Plastics and Meat, here. States of Perfection: the Refrigerated Archaeology of Meat, here. Selling to Simple Women, 1939: "She's Not Interested in Bloody Meat", here. The Importance of Bridges in the Invisible Evolution of Meat, here. 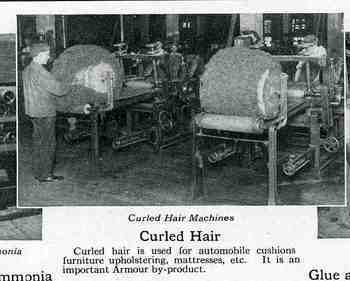 The following impressions are a result of reading the Armour & Company's hard-sell-we're-really-really-clean promotional pamphlet, Seeing Armour's. (I'm not sure why there is a plural possessive in the title, which is lopped off in the photo below--the pamphlet is actually splayed out here, opened from the 4x7.5 oblong to show both sides of the cover, revealing both halves of the vastness of the company's campus). the String Department. (?) How deflating it is to start thinking about this concept. 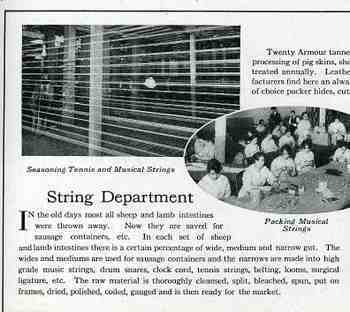 Yes, of course, of course there is a string department at the Amour Meat Packing Company, though they're not making the stuff from field-grown fibers. This string is just gut, but useful gut: "In the old days most all sheep and lamb intestines were thrown away. Now they are saved for sausage containers, etc." Et cetera? I'm not sure if the "etc." part is more baffling than the originality of the opening sentence (and a sentence which is probably never-before encountered). There's wide, medium and narrow gut, as it turns out, and it was cleansed, split, bleached, spun, put on frames, dried, polished, coiled and gauged. (Now that's a job title: intestinal string polisher). There were a number of other expected/unexpected surprises. The Curled Hair room was a surprise. I was expecting the soap room but didn't expect the huge interior that it filled, with hundreds (?) of young women (all dressed in white) seated at long wide tables with mountains of soap, doing god knows what. Oleomargarine, bullion, extract of beef, sausage, leaf lard and bacon were expected; the eggs, butter, cheese, grape juice, peanut butter, salmon and fruit syrups departments weren't. Armour seems to have been waging a veritable food war, with a little bit of beef/pork/sheep going into a little bit of everything. Finally, having had just about enough of Mr. Armour, I stumbled into the stuff on the killing rooms. Even though the description is cleaned up i the pamphlet, it still is not pretty, and sharing the photographs is just not necessary. 20 years a vegetarian, here. The Jungle was written by Upton Sinclair (often referred to as a "socialist" which he definitely, positively, was) in 1906. It was basically an expose on the living and working conditions of the lower working classes, and is best remembered for bringing to vast public knowledge the grotesque conditions of the meat packing industry. It is not possible, really, to overstate its importance, which is credited with leading to Meat Inspection Act and the Pure Food and Drug Act of 1906, which established the Food and Drug Administration. Looking at old advertisements for the application of new/improved pharmaceuticals can be an experience in search of an explanation. Certainly we recognize the impact of these drugs today for what they really are, the business-end of their basis unmasked. But at the time--well, at the time, before revelation, there was hope in the use of them. Opium of course has been used for centuries, but it was synthesized first in 1874 by the English chemist C.R. Alder Wright, though that first application went basically nowhere. The big push came when it was independently re-synthesized and re-discovered by Fleix Hoffmann who was working at the time for the Aktiengesellschaft Farbenfabriken of Elberfeld, Germany, which is todyay known as Bayer, and which was re-named and marketed under the name, "heroin". Heroin was sold for nearly two decades as a cough suppressant, a safe replacement for morphine, and also non-addictive. Narcotics in general however were applied somewhat liberally for complaints of all manner--narcotics not being controlled until 1925, banned by the Single Convention on Narcotics Drugs and the League of Nations (for its signatories, at least). AS we can see int he detail of this Punch cartoon of 1879, the problems to be brought on by the new applications of electricity (still quite young in its modernistic sense at this time) could be sleeplessness for birds, as the outdoor lights might keep them awake. This piece of propaganda and racial attack appeared in Los Angeles in 1889. The National Bakers Union called for a boycott of The Original Coffee House for purchasing their baked goods from a "scab" bakery identified as Brown's Restaurant and Bakery. Their crime was magnified by using Chinese people instead of making use of "hundreds of capable and deserving White People" were seeking employment. The union also made a connection between the next-door undertakers (and the possibility of the seepage of vermin and such) with the use of the Chinese workers. Source: I originally found this post at the Bay Radical website, here, though the image above is a high resolution download from he Library of Congress, here, from their Chinese in California collection. "PECK & McCOY, Undertakers and Embalmers, No. 40 NORTH MAIN STREET. Telephone 61. Day or Night, from Los Angeles Herald, Volume 31, Number 145, 25 February 1889 — Page 6 Advertisements Column 1 [ADVERTISEMENT], California Digital Newspaper Collection, here. " The Chinese population in L.A. had grown markedly since 1850, and by the mid-80's there were some 3,000 living in Chinatown in a city of about 50,000 people. There was a notorious riot and massacre of Chinese people there, in Chinatown, a result of a white man killed accidentally int he crossfire of a gunfight between two rival Tanns. The establishment went crazy and exacted a gross revenge, burnign amd looting, and killing 19 men and boys. Racism and discrimination are never so more obvious I think than when it is present in everyday bit and pieces of our lives, as gratuitous indulgences, unnecessary except to disparage its target--it is at these times that you can see how deeply something is ingrained in the culture of a place. And an excellent example of this is the transforming/movable puzzle created by the master puzzleteer, Sam Loyd. He patented the idea of mechanism of the thing in 1896 and published it in the same year, selling millions of varieties of the thing. One of the most successful of the puzzles using the design was called, with a fantastically indelicate title, Get Off the Earth. Working version from the murderousmaths.co.uk website, here. The title would mean less had not the most popular version of the game featured Chinese men who were getting off the Earth, and this of course at a time of indoctrinated, inculcated, adjudicated and legislated, legalized segregation and discrimination. It was a time of very high Sinophobia, with all manner of advancements against people of Chinese descent: the Anti-Coolie Laws of 1862, the Pigtail Ordinances (of California) of 1873, the Chinese Exclusion Act of 1882 (renewed in 1892 and 1902), and so on, displayed America's unease and at times hatred of the Chinese people. Loyd referred to the men as "warriors", which I think disingenuous, as the characters hardly have a warrior-like quality to them--they are simply racist. And they were being made to disappear from the Earth, something many people in this country wanted to happen. According to several web sources, the puzzle was actually used by the William McKinley campaign of 1896 in an effort to out anti-Chinese his opponents2. What these objects do for us today is help us think about what "get off the Earth" objects we have in 2012, and how awful they'll look in the decades to come. The fabric of society has not crumbled under the weight of allowing non-land-holders to vote, or to allow women more equal rights or the right to vote; abandoning slavery did not crush the country, nor did Brown v. Board of Ed, nor did the abandonment of the miscegenation laws. I can hardly believe that an issue such as Gay marriage will be the great under of the Republic as it has been present in legislation and state constitutional amendments; it will look as bad in a few decades from now as does the Get off the Earth puzzle looks now, or the idea of slavery, or the idea of voting privileges only for the privileged male, or maintaining Jim Crow laws, and so on, on a nd on into the misty night of bad ideas and societal discrimination. 1. Nice stories on Sam Loyd and deep on puzzles in general, here. Sam Loyd's book of 5,000 puzzles. 2. A summary of the McKinley presidential campaign making use of the puzzle to help raise itself in the eyes of the anti-Chinese voters, see here. The odd thing is that current sites have referred to the men surrounding the globe (below) as "Chinamen", or still use the Loyd reference to "Chinese warriors", and many still hold to the indulgences that this is a simple puzzle and nothing else. It is hardly that simple. 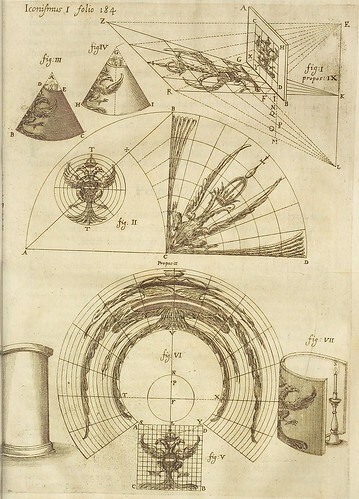 In his fabulous four-volume work, Nouvelles recreations physiques et mathematicques (published from 1769-1770), Edme Gilles Guyot (1706 - 1786) writes about applied math and physics and optics and the associated over a very wide landscape and dives deep into their distracting, entertainment value--polite intellectual diversions, optical illusions, and artistic magic. And not "magic" as in the supernatural/paranormal flavors--but performance magic, the art of magic, that employs elements of the sciences to trick the audience--and reveals its secrets to his readers. Between 1914 and 1918 when many of the nations of the world were at war, Poland as a nation did not exist, though its nationalities and spirit and idea certainly did; and though it didn't exist as a country on the map Poland was the home to numerous battles of the Eastern Front, fought on Polish soil. Having been partitioned by the Germans, Russians and Austro-Hungarians, and having Germany and Austria-Hungary pitted against the Russia during the war meant particular hardships and brutalities as the Central Powers and Axis fought for land and the heart of minds of the people who lived on it. This ad, which appeared in the Illustrated London News for 2 October 1915, was a display of combined sympathy and support for the Polish people in a particularly bad year, when it was occupied by Germany and retreated through by the once-friendly-notion of Russia (the retreat costing the country a lot in the process). The advertisement--a public service announcement--was about 10.5 inches by 5 inches, and appeared a number of times in the magazine during 1915 and 1916. The ads seemed to disappear after that, though the usually-accompaniment of "Holricks Malted Milk" ads pressed on, unabated. A fascinating aspect in modern technology and warfare is the reliance upon pigeons and dogs--and their achievements--for war services. Evidently several hundred thousand pigeons were used to relay messages between divisional headquarters and battlefield positions and such during WWI, with something like 90% of the messages being delivered successfully--a remarkable achievement, since it was not uncommon for the pigeons to fly dozens of miles to perform their task. The services worked so well in fact that the American carrier pigeon service training facility for the army was not closed until 1957. Dogs were used as guards and ambulance litter carriers, but it seems they were mostly used for communication purposes, taking messages back and forth through the masses and intricacies of trenches.